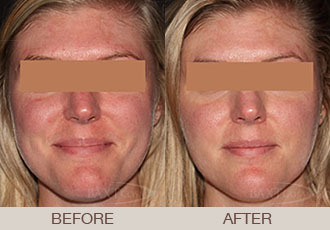 Using ultrasound energy, Ultherapy® treatment lifts and tightens skin on the face, neck, and chest. Ultherapy treatment works on the deep layers of tissue usually targeted during a facelift or neck lift, but leaves surface skin alone. By heating tissue with sound waves, collagen production increases, resulting in younger-looking skin. According to its manufacturer, Ulthera, Inc., Ultherapy® treatment “is the only noninvasive procedure FDA-cleared to lift skin on the neck, chin and brow.” Ultherapy® can now be used to reduce wrinkles on the décolleté. How soon after Ultherapy® will I see results? It takes time for the body to heal the microtrauma caused by the ultrasound Ultherapy® treatment and that results in collagen growth and tightening. Results, however, vary from patient to patient, and on the condition and quality of the skin being treated. Although some patients may see immediate improvement, results of Ultherapy® treatment are usually apparent within 2 to 3 months, during which old collagen is replaced with new, more elastic collagen. At 6-9 months, full benefits are attained. It is possible for results to last up to a year, sometimes longer*. We will perform one treatment and wait at least 6 months to determine if another is needed. Most patients need only one treatment, but those with significant issues may require more. Many of our patients like to do Ultherapy® once a year or once every 2-3 years to help keep their skin tight and reduce any aging. Can Ultherapy® be performed instead of a surgical facelift? No, Ultherapy® is not a facelift. Ultherapy® treatment is not a substitute for a surgical facelift, but is an option for those not interested in or ready for surgery. We can give you an honest answer as to what procedure or treatment can best help you achieve your goals. After Ultherapy® treatment, you can go straight home. There can be some mild redness and swelling, and rare bruising. The area that was treated can be sore and slightly numb to the touch for a few weeks afterwards. Ultherapy is FDA approved for skin tightening on the face and neck and chest. It works well to tighten skin. We are very honest with our Ultherapy® consultations, and if we think Ultherapy® will not work, we won’t do it and we would recommend a plastic surgery consultation. Good candidates are looking for a small lifting, subtle, natural results. Ultherapy® is a great antiaging treatment for all skin colors and types. If you are interested in Ultherapy® treatment, contact our office at (201) 265-1300 to schedule a consultation.